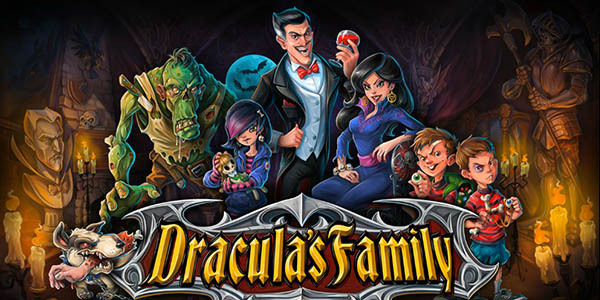 I bet when Bram Stoker first put pen to paper on his novel Dracula rumour has it that he always hoped that his vampire creation would eventually be immortalised in an online slot game, along with some new additions; his family. Nevertheless, this is a great casino slots online game where you must match symbols of members of the family, Frankenstein, and ghostly letters to earn yourself a huge fortune. Playson is once again set to delight players with with its ingenious themes and features, striving to place themselves in the lead of the online casino industry. There’s nothing that could compare with their interesting gameplay, high quality graphics and most of all, dedication towards increasing the players’ winning chances. Dracula’s family is an adaptation of the famous vampire legend from Transylvania, perfect for players who want to get spooked and win big. Watch out for any sharp fangs, though! Deposit and play slot games today! You have the rare occasion of being invited to count Dracula’s grand house, where various creatures lurk about and there’s the danger of having your blood sucked at every turn. If the adrenaline of it sounds fun, step in! Dracula and his scary family are waiting. You’ll meet his beautiful, yet deadly wife, occult loving daughter, mean looking twins and hideous monster. So don’t be fooled by Dracula’s charming smile, there is a myriad of traps in his huge and dark mansion. If you come out alive, though, you’ll most probably be a lot richer. Dracula’s family likes a courageous soul, and they will reward you if you show potential. This easy slot game has 5 reels and 15 spooky paylines. The graphics fully exploit the theme, building a barely lit, creepy and old chamber in the background, and allowing you to really feel the atmosphere, enriching your experience. Wolves howling, evil laughs and other strange noises will make your skin crawl, but you’ll still enjoy it for the wins. There is also a well-made animation at the beginning of the game, meant to properly introduce the members. Dracula’s family has a minimum bet of 0.30 credits and a maximum bet of 45 credits, so all you have to do is make a choice and press spin. But remember, the higher the bet, the bigger the win! Now discover how to pay with phone credit slots. There’s so much Dracula’s Family has to offer, besides the attractive theme. The Wild Card is represented by the Dracula Twins, and it substitutes any other symbol, besides the Scatter, in order to form more winning combinations, after which two of the reels transform into Wild Eye symbols, for some extra prizes. The Scatter symbol is the Dracula’s Family logo symbol, and if you spin 3 or more of them, you activate the first of 4 Free Spins Mode. In order to activate the next mode, you have to play at least 3 games in the previous one, until you’ve unlocked all of them. The first one is the Mad Multiplier mode, accompanied by Dracula daughter, where you are given 15 Free Spins and all winnings are multiplied by 5x. Then the Eternal Love Free Spins mode is represented by Mr and Mrs Dracula. During it, the spouses appear only together in a symbol with a payout of up to 175 credits. The Wild Whistle-Heads Mode is next, where the Dracula twins transform 3 of the reels in Wilds. Lastly but not least, in the Delirious Reels Free Spins, Dracula’s Monster takes charge. Whenever a winning combination is made, the panel moves one reel to the right, and the multiplier increases, with a maximum of 7x. 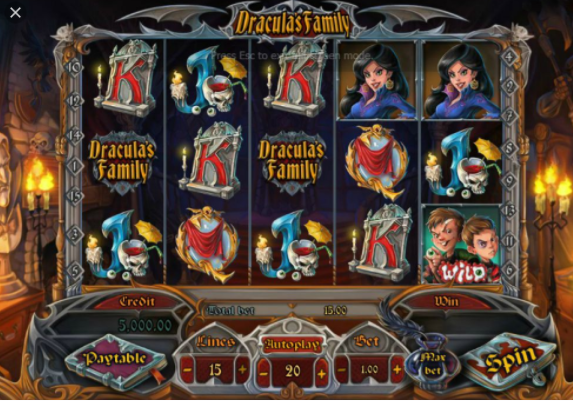 Dracula’s Family is a very well-designed horror slot game, catering for lovers of vampires and monsters. With so many exciting features, you might even forget you’re scared! Another juicy game to get stuck into is Sugar Train Slot.